Tales of Vesperia is a game that’s always been near and dear to my heart. I don’t think it’s the best Tales game, nor is it my favorite, but it’s one that I enjoyed quite a bit. Twelve years after its initial release, we finally got access to the full version of the game. But how does it hold up? The answer: It’s a mixed bag. Japan received the PS3 version of Vesperia shortly after the original’s release on Xbox 360 because the country simply didn’t (and doesn’t) care much about Microsoft’s gaming systems. But that version never made it to the States, so here we are in 2019 getting our first chance to try this out. And it’s great to finally get some content that we’ve been missing for all these years — two more playable characters, extra Mystic Artes, plenty of costumes and accessories, new bosses and music, etc. It’s the execution and importance of said content that’s all over the place. The two new party members are Flynn, who only joined for one fight in the original, and Patty, who is brand new. Flynn doesn’t realllllly count as a full-time party member, but he’s there for the dungeon that concludes each of the game’s three arcs, aka the important parts. That also means he’s around for all the end- and post-game content. It’d be nice for him to be around a little bit more, but there are story reasons that pretty much preclude that from happening. Patty is a mess. She spouts off pirate gibberish and similes most of the time, little of which is connected to anything happening around her. While I’d be curious to see if someone playing the game for the first time thought it was this jarring, to me, someone who’s played it multiple times, it felt extremely out of place whenever she opened her mouth. Her moveset is interesting, but almost entirely based on luck and random outcomes. I’m not saying she detracts from the experience, but I’m not sure what she adds. 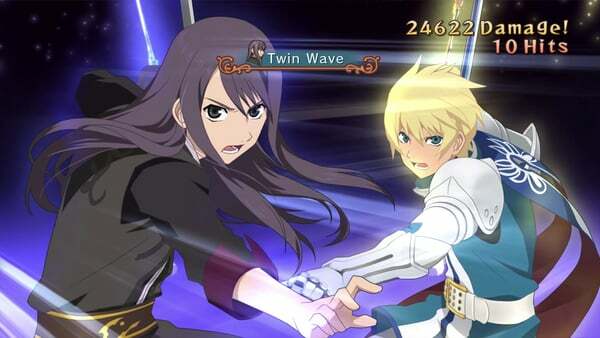 The new costumes are a welcome relief for Tales fans who have watched the series push more and more of them into DLC over the years. There’s a ton to choose from, as well as new attachments. The only downside is that most of the newer outfits don’t allow attachments to show up. The extra artes and Mystic Artes are a nice addition overall, giving you even more options to work with in combat. This is also true of the skills you can learn from weapons; there are some new ones, and several of them open up some cool new possibilities for combos, mobility and more. But the new dialogue and voice acting is also a mess. Yuri Lowell was a Troy Baker masterpiece, but he wasn’t approached about recording new dialogue. Judith is in the same boat, meaning that a voice actor can change between scenes (or in the middle of a scene) in what can only be described as an extremely jarring experience. But what’s worse is some secondary characters — while you eventually get used to the new Yuri and Judith, no amount of advance warning can prepare you for what happens the first time Don Whitehorse sounds nothing like Don Whitehorse. It’s a disaster. The new bosses and other content are a solid addition overall. The bonus post-game dungeon is a neat idea that doesn’t quite reach its potential. Branching paths inside of a string of battles sounds like an interesting concept, but what you end up with is a series of repetitive fights against familiar enemies — and with so many floors, that’s a ton of fluff. However, after more than a decade of me bitching about the game’s lack of team coliseum, it’s finally here! And it has fun, challenging cameo battles! So that’s cool. This is certainly the “definitive” version of Vesperia as far as depth of content and options. I’m not necessarily sure it’s the best way to experience the game. But if you have a current-gen system or love the idea of playing a colorful, fun JRPG on the go with the Switch, it’s worth a look. Some parts of the experience will leave you wincing a bit, but the overall experience is still an enjoyable one.